We are all collectors at heart. It gives me great pleasure to sit back, unwind, and enjoy my coins! Often on a Saturday morning I will spend a couple hours going through one of my collections, studying my coins and learning more about them. For security reasons, most of us keep our collections in a safety deposit box, however, I can enjoy my coins while in a comfortable chair with my laptop using the PCGS Registry and My CoinFacts! The My CoinFacts addition to the PCGS Registry is a wonderful improvement that helps me get closer to my coins (the blowup feature is far better than a magnifying glass) while keeping me informed on market activities and other important information. Check out this week’s video for a brief introduction to My CoinFacts. If you were to start your collection today, which of these coins would you add first? It’s back! Some 27 years after the discovery of the S.S. Central America, and about a dozen years after the original offering of lost treasures from the 1857 shipwreck, another load from the ocean floor is about to begin the process which will eventually lead to its entry into the numismatic marketplace. As we documented last month, PCGS Photographer Phil Arnold discovered that cable giant Comedy Central that altered one of his images for use in a promotional campaign for the show Drunk History. Phil is happy to report that the ‘case’ has been settled out of court. PCGS recognizes both Mint State and Proof versions of Judd 1022, but researchers have always wondered why such a rare pattern would be struck in two formats, or if they really were. After all, most patterns are either Mint State or Proof, but not both. As Ron Guth explains, CoinFacts research led to the riddle being solved. On September 16, the U.S Mint began offering the Uncirculated 2014 Presidential Dollar Coin sets. 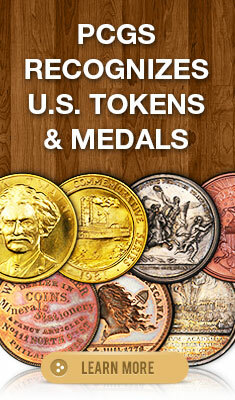 The Sets contain coins depicting Presidents Warren G. Harding, Calvin Coolidge, Herbert and Franklin D. Roosevelt. Legend Rare Coin Auctions’ October 2 Regency Auction IX will feature the Simpson-Sunnywood Collection of Toned Morgan Dollars. The auction will be held in conjunction with the PCGS Members Only Show at The Bellagio in Las Vegas.